This reminded me of when I was on MTBs back in 1965/66 and being called on to use our guns to start an avalanche in this same area of Mageroya. We fired off a few live rounds from our 20 mm. Oerlikon gun from a safe distance, watching snow cascade down the mountainside until it hit the water and making a mini-"tsunami". Sounds like fun Ombugge! The Daisybell technology they use now sounds so simple, yet clearly very effective. If you have a helicopter! 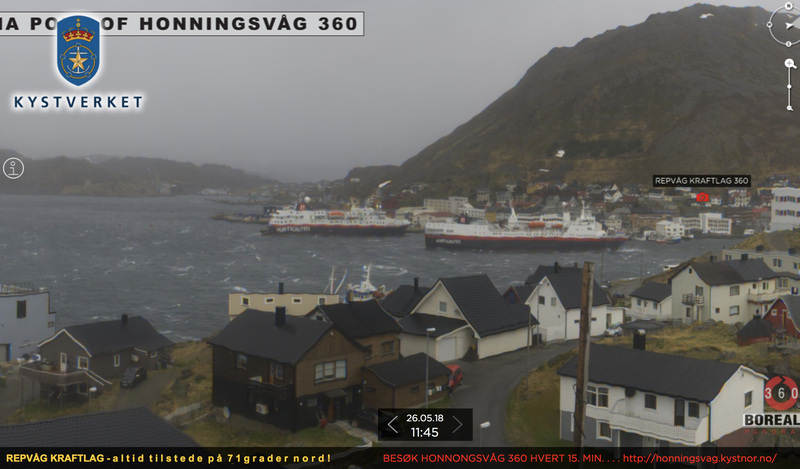 Something you don't see every day - two Hurtigruter in (a very stormy!!) Honningsvåg. Vesterålen on the run northbound, and Spitsbergen in expedition mode. From the brilliant porthonnigsvag.kystnor.no camera. Nice web-cam view.... it certainly doesn't look like "summer"... more like an autumn storm-day. It was sunny for about 1/2 hour! More photos in the days and weeks to come. God sommer, have a happy Sankt Hans! NICE! If that was taken on midsummer, you were so much more lucky than us here in Trondheim. We had rain, sun, rain, wind, some more rain, some short periods of sun, and then overcast.... and that was just within 30 minutes! Pity, because I really wanted to experience the lightest day of the year. So dark and cold that day! 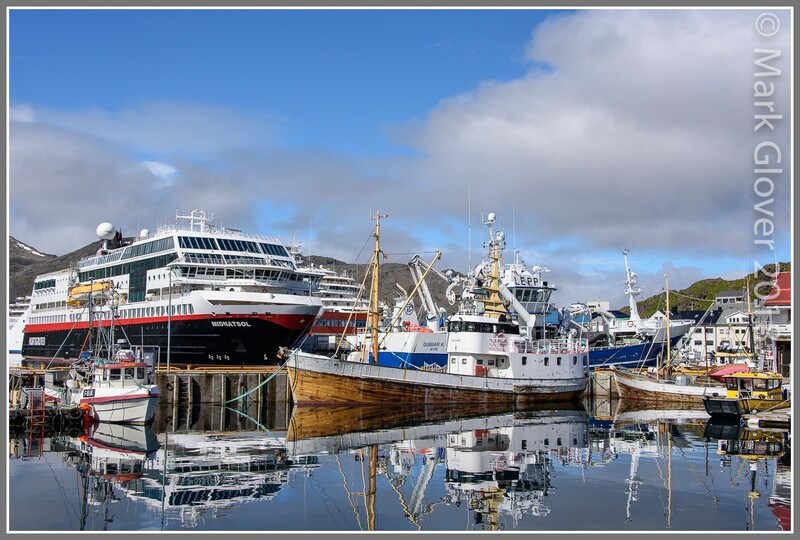 It's all happening again in Honningsvåg today/tomorrow (17th/18th August). MS then came back to H'våg, arriving at about 8pm, with the fast boat Melkøy in close attendance. They joined MSC Meraviglia which by now had also got decked overall! Assume that the bicycle race circus, or at least some of it was on board. MS will now run non-stop to KKN tonight. Not only the bike race, but all sorts of other things going on tomorrow, plus two 90,000+ tonne boats booked in. And if that wasn't enough - the biggest of the souvenir shops burnt down this morning! Really, really wish we were still back in our Norwegian home. Goodness me ...this is like a newsworthiness contest between you for Honningsvåg and Tommi for Strängnäs! That sounds like a busy week for Honningsvåg - pity all the visitors can't buy any cheap souvenirs from China, imitating Norwegian trolls and such.